Roasted garlic is simply delicious. Roasting helps mellows out the overpowering taste, spiciness, and smell of raw garlic. Its also softens the bulbs up. Try adding them to pizza, salads, pasta, or just on top of some good bread. I like to roast garlic a little differently than you are probably used to. I didn’t invent this method, but I have switched it up a bit to meet my preferences. I promise the end result is just as good or better, and you get a bunch of garlicky oil too! 1 small glass baking dish. I use a bread pan. 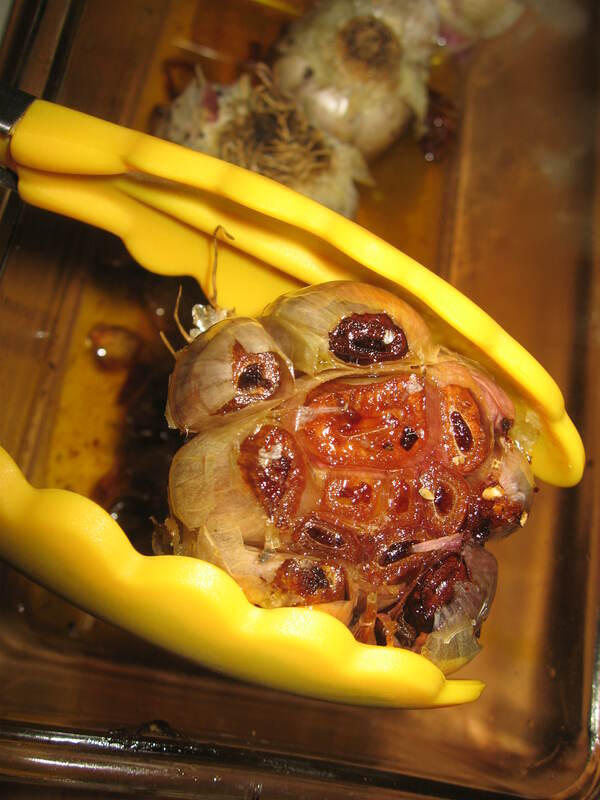 3-4 heads of garlic, outer skins rubbed off, and tops cut off to expose most of the bulbs. You need just enough garlic to fill your baking dish. Do not throw away the pointy little ends that you cut off! 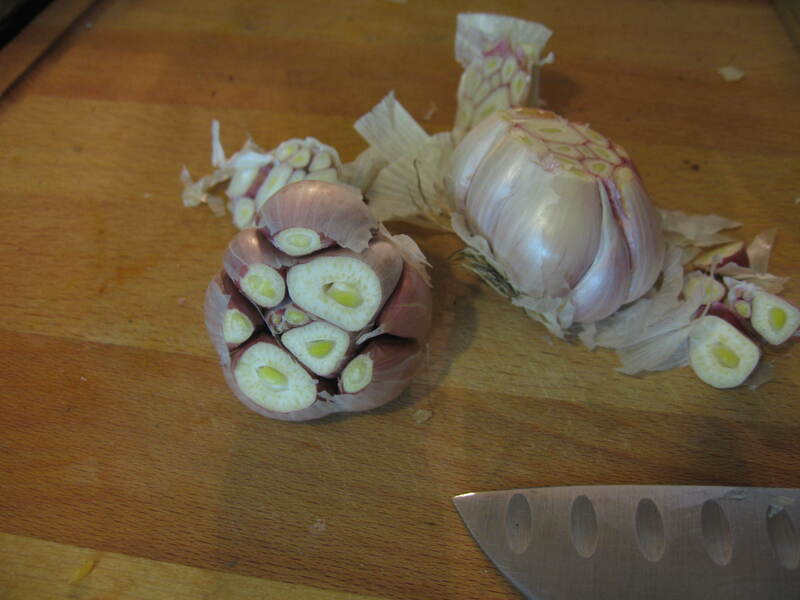 Place your trimmed garlic heads, cut side down, in your baking dish. Smash the trimmed tops with a large chef’s or santoku knife, and put in bottom of dish as well. Pour over the top, ½ cup of the olive oil. Sprinkle over that the sea salt and fresh black pepper. Cover with tinfoil. Bake at 400 for 40 minutes. After 40 minutes, check your garlic. If it squeezes out of its skin easily it is done. However, if it’s not soft enough yet, add ¼ cups more olive oil and put back in the hot oven for 5-10 more minutes. Wait for heads and oil to cool. Watch out, because that oil is going to be very hot when you remove the tin foil and there will be some steam in there. 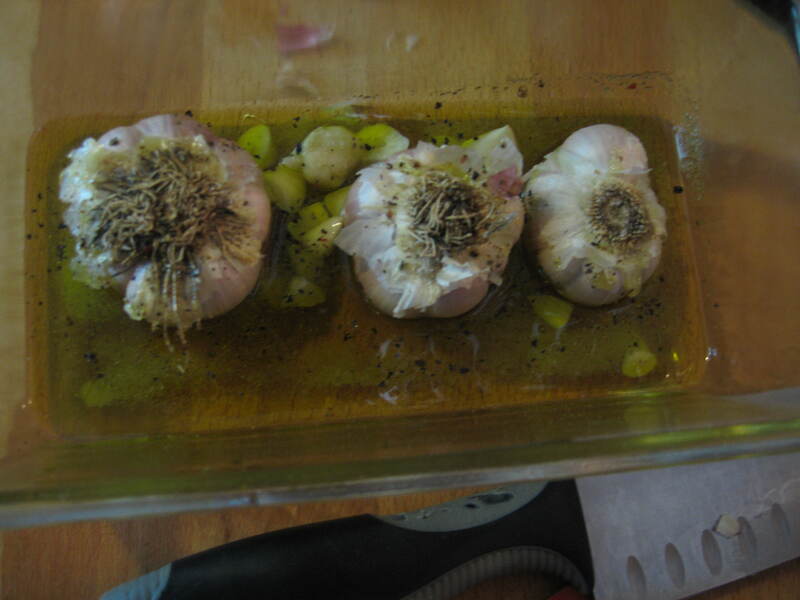 Once everything is cooled off, make sure to take the garlic out of the oil, otherwise it will soak it all up. Enjoy your roasted garlic! Make sure to save the oil for making hummus, salad dressings, adding to pasta sauce, etc.